Objectives: Previous studies have found the association between rs10865331 in 2p15 area and ankylosing spondylitis (AS). 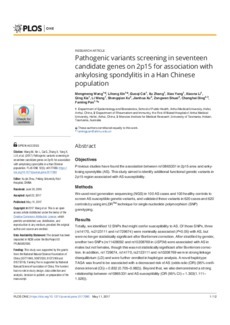 This study aimed to identify additional functional genetic variants in 2p15 region associated with AS susceptibility. Methods: We used next generation sequencing (NGS) in 100 AS cases and 100 healthy controls to screen AS susceptible genetic variants, and validated these variants in 620 cases and 620 controls by using imLDRTM technique for single nucleotide polymorphism (SNP) genotyping. Results: Totally, we identified 12 SNPs that might confer susceptibility to AS. Of those SNPs, three (rs14170, rs2123111 and rs1729674) were nominally associated (P < 0.05) with AS, but were no longer statistically significant after Bonferroni correction. After stratified by gender, another two SNPs (rs11428092 and rs10208769 in USP34) were associated with AS in males but not females, though this was not statistically significant after Bonferroni correction. In addition, rs1729674, rs14170, rs2123111 and rs10208769 were in strong linkage disequilibrium (LD) and were further enrolled in haplotype analysis. A novel haplotype TAGA was found to be associated with a decreased risk of AS (odds ratio (OR) (95% confidence interval (CI)) = 0.832 (0.705-0.982)). Beyond that, we also demonstrated a strong relationship between rs10865331 and AS susceptibility (OR (95% CI) = 1.303(1.111-1.526)). Conclusions: rs14170 and rs2123111 in USP34 and rs1729674 in C2orf74 may be associated with AS susceptibility in Han Chinese population. USP34 and C2orf74 in 2p15 region may be AS novel susceptibility genes.